And I’m sorry, but I’m a sucker for a good pun. This pattern is entirely seamless – the ears are worked by picking up stitches, and there’s a little grafting at the front – instructions for which are given in the pattern. 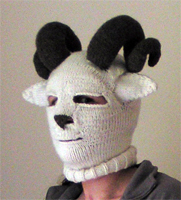 As per my previous mask patterns, I’ve used an aran weight yarn with 4mm needles. The pattern gives two sizes – standard (19″ to 23″) and extra large (24″ and up). Three Ply III: The Search for Squoosh. That’s amazing! How difficult is it to do? 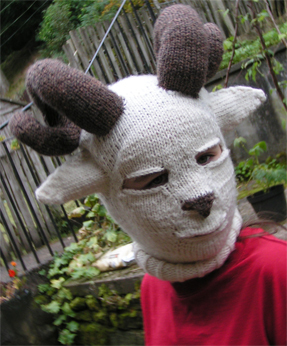 My wife has recently taken up knitting, and I am not sure how to determine whether this is beyond her skills. It’s not terribly difficult – if your wife can knit in the round, pick up stitches and work kitchener stitch, she’ll have no trouble with it! There’s no seaming. That actually looks really good. No doubt ye could do a plain lamb’s one with just the eyes, and without the horns? A lamb’s one would be simply adorable, with only the eyes to express any embarrassment! Hi, it just means that after knitting your ten stitches with scrap yarn on one row (rather than knitting the stitches with your main yarn) when you turn and purl back across that row and reach those scrap yarn stitches, just keep on purling with your main yarn! and in lots of other places too, if you have a quick google. That video (and most of the other tutorials) go on to show what happens later, when you reach the part where the scrap yarn stitches need removing. Thank you very much! Yeah, that makes sense.